NOTE: This is the reprint version, with all new interior art by Mark Allen. This book combines the two books from the original boxed set. The introductory adventure is now provided separately as a free download. Lurching into action, your battered chronoscooter crosses the void of time and space. Another lurch, and the vertigo fades. The countryside comes into view. Knights in armor battle, clanging sword against shield, and then someone blasts at your neck with a laser beam. Once again, all of Time is a mess, and as an agent of the Time Corps, you must set this world straight or die trying! Adventure to any place, any time, in this universe and beyond! 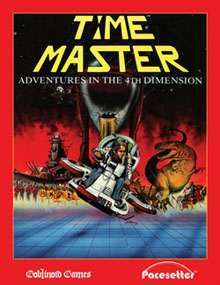 The TimeMaster Roleplaying Game makes you master of the "Fourth Dimension", guiding you to the ultimate adventure in history, legend, and science fiction. fight cunning aliens and savage renegades who twist Time to their own purposes. Only skill and wit stand between the world you know and absolute chaos! I used to have the old boxed version years ago and am considering buying the PDF and have a question. Is the map and counters from the old box set version in the PDF? I remember you had to use them in many of the old Timemaster modules for specific parts of them. The final page of the pdf is a sheet of 140 tokens. Just in black, most are silouhettes of people, tanks and various military weapons. Is that what you were after? There doesn't seem to be a map anywhere. Is it possible these are in the first adventure pdf? The description says "The introductory adventure is now provided separately as a free download" so might be worth checking that out.